Editor's note: Landing spot and age are the two most important variables when it comes to drafting a fantasy running back in our opinion. However, talent matters as well. This series aims to show you what a running back could do at the next level. How he can be used, what systems he fits in, can he catch, and more. To sum Montgomery up. He's a magician in the open field with his lateral movement to elude defenders. He also has good balance to keep his feet under him after contact. He's a good pass catcher and could be an excellent screen pass back at NFL level. His biggest weakness is his initial burst. He doesn't accelerate quickly through the hole which means faster NFL defenders closing the gap on him too often. He wouldn't work well in a gap system. But he's an ideal zone-blocking runner. Plus his pass catching ability makes him versatile. He could line up in the slot for some teams like Christian McCaffrey in Carolina. Let's look at some clips that illustrate these points. This is one of the areas where Montgomery really excels. He has soft hands, gets up field quickly and can make defenders miss. The NFL is a passing league and running backs have to have this trait to be productive now a days. Here's a pass where he showcases this ability. Notice how he catches the ball behind him but is already turning to recognize the defender. This allows him to make his first lateral move before the defender has a chance to get set. Then he plants his foot and makes the safety miss. This kind of elusiveness in the open field is what could make him a great PPR fantasy back. Here's another example below. In this clip, Montgomery runs a crossing route. This type of route is one you could see him excelling at in the NFL. When he catches the ball in space, he can use his lateral movement to string multiple moves together. Here you see him plant his foot in the ground to elude a linebacker. Then cut up field and spin off to elude another defender. Here's a pass he caught against Oklahoma St. It's kind of a flashy catch and he obviously won't have to make this catch very often. But it's good to know he has the ability. Notice how with this catch with a defender draped on him. Shows great concentration to reel it in with one hand and uses his balance to stay on his feet through the tackle. Montgomery can also be used in the slot as you'll see in this next clip. This year's running back class as a whole is not very fast. Montgomery, like several other top backs in this group, didn't show out at the combine in terms of speed. His 4.63 40 time illustrates that. This will be a question mark for him at the NFL level. Does he have enough burst to get to the hole quick enough before the defenders collapse on him. Despite his speed concerns, Montgomery really excels in the passing game. He caught 71 passes for 582 yards while at Iowa State. After the catch, he gets up field quick and makes guys miss. If he finds himself on a team with an accurate quarterback, Montgomery could be a solid contributor early on. Landing spot is key though. But if a good team drafts him, he's worth taking a flier on in redraft leagues. Editor's note: This is not direct advice telling you to draft this particular player. 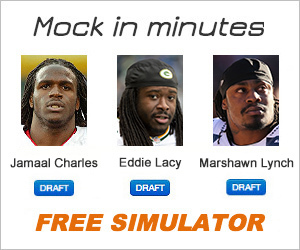 The 'What Can This Rookie Do For You' series aims to show you the traits of each running back. What scheme could lead to the most fantasy points for him. And any other noteworthy things. Justice Hill is an explosive runner with the burst to rattle off big chunks of yardage in the right system. We will dive into what that system is and how he could be effective for an NFL team and your fantasy team. Hill's combine numbers illustrate his burst ability. He ran the fastest 40-time at the 2019 combine among running backs (4.40). He also tested among the highest for the broad and vertical jump. This explosiveness is shown on the field with his ability to change strides and accelerate. But although he ran a great 40, there are some things about his game speed that don't exactly translate to the field. Hill frequently gets chased down by defenders in the open field. Meaning he's not as fast in pads as he is in shorts. But even though the tape didn't show Hill as a true home run hitter, there's still a lot to like about his game. Let's see where he fits best in the NFL. Born for a gap system? Hill was used primarily in the shotgun at Oklahoma State. Though they occasionally split him out wide. He's at his best when he can sift around the line, find a lane and use his burst to accelerate quickly for chunks of yards. You'll see this in an example below against Kansas State. Notice how fast he gets up field after he decides where to run. His burst allows him to cover a lot of ground. Leading to a big gain. This was made possible due to him identifying the running lane and then shooting down the crease. Because he's undersized, Hill will likely struggle as a short yardage back. So don't expect a lot of goal line touchdowns from him at the NFL level. Though he's undersized, the effort is definitely there with Hill. He fights for extra yardage and can even take a few players along for a ride from time to time. The running back position is a raw one, where those little extra inches of effort pay off in the form of 2-3 more yards. Hill can definitely do this. He can fight and move the chains. As you'll see in this run below. Whether or not Hill can do this consistently will decide if he can be a solid backup or just a depth guy at the NFL level. What could hold him back? If you draft Hill to your fantasy team, you're going to have to hope he improves his pass blocking. This was a weak area for him at Oklahoma State. Although he struggled, he does show mental instincts to know where to be on the field when it comes down to who to block. He sometimes dives at defenders, which can be ineffective. This could keep him off the field on passing downs. But it's common for younger running backs to struggle at this and many have drastically improved with practice. Though he wasn't thrown to a lot in college, Hill showed some ability to make plays in the receiving game. He was especially effective on flat routes where he could just turn up the field and go. Despite that, he was pretty limited in his routes run at Oklahoma State. So there's not a big sample size to look at. However, it doesn't mean that he can't catch at the NFL level. Hill is an exciting runner. He racks up yards quickly due to his great burst/acceleration. He's not a pure home run hitter as he lacks top line speed. He also struggles in pass protection as of now. There's potential for him to have some success in a gap system at NFL level. Editor's note: In this series, we dissect how upcoming NFL rookies can help your fantasy football team. This is meant to show you what kind of stats he can pile up for you if you draft him. Of course, scheme fit, coaching philosophy, and offensive line skill are key as well. But this series seeks to isolate the particular player for what he can do by himself. Ideally, an NFL team will use his skillset to the fullest. Though that might not always be the case. To get the most out of this series, pay attention to what he does well and adjust it to the rules of your particular league. Of course, we don't know for sure which team will draft him. But this will be a good indicator of what to expect from him. On the final 2017 episode, the Helpers dole out their awards for the 2017 Fantasy playoffs. This year's titles include the '11th hour,' the 'we can't complain to that guy on Twitter anymore,' the 'where did that guy come from' and the honorable 'sweet streams are made of these' mention. Hope this season was a successful one for you all. But that's not really mathematically possible, but you still probably had fun and that in and of itself...is a success. Tired of getting beat my sharks on big name daily fantasy sites like Draftkings and Fanduel? Use the promo code 'FFHelpers' and play Daily Fantasy Football at DRAFT a daily fantasy website that gives you an 80 percent better chance to win based on the payout structure.